Where were you when Donald Trump announced that he was running for President of the United States back in June of 2015? I know where I was! I happened to be staying at the Trump Las Vegas hotel with my youngest son. We were eating an amazing breakfast in the hotel restaurant when Donald Trump announced his campaign. And I remember thinking that if he could run the country as well as the Trump Las Vegas hotel is run I would consider voting for him. Now that may be a crazy thing to think, but the Trump Las Vegas hotel is fantastic. Let me tell you why I loved it. 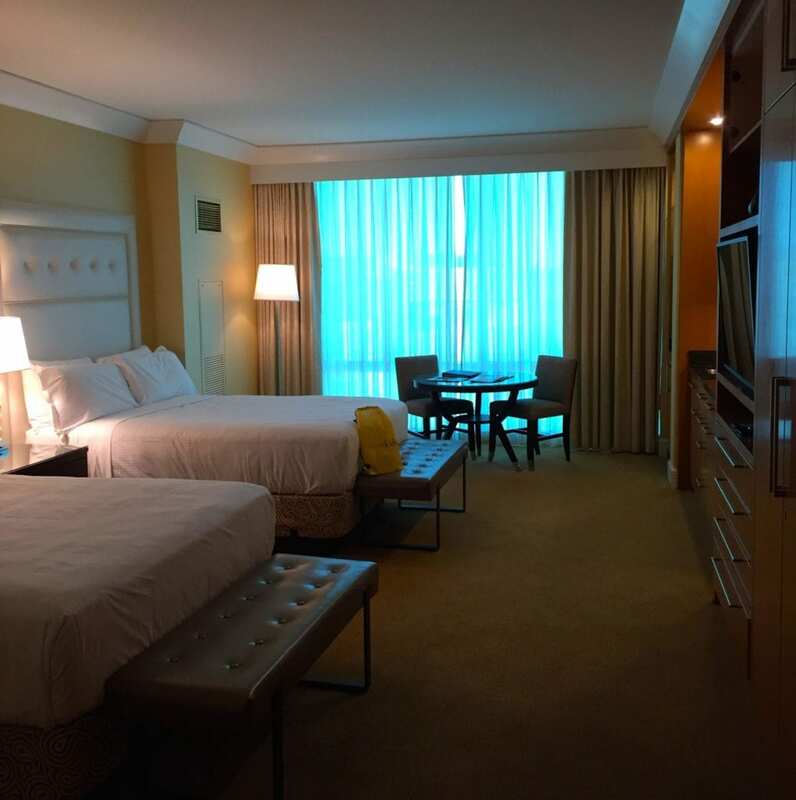 I always love staying at the five star Trump Las Vegas hotel. The place oozes luxury, which I appreciate. I mean as soon as you walk in you are greeted by beauty and an attentive staff. In the above photo you can see some of the opulence like massive chandeliers and gold embellishments everywhere. The decadence does not end at the lobby, because the rooms are incredible too. We stayed in a room with two beds. Last time we stayed we were in a room with just one bed. 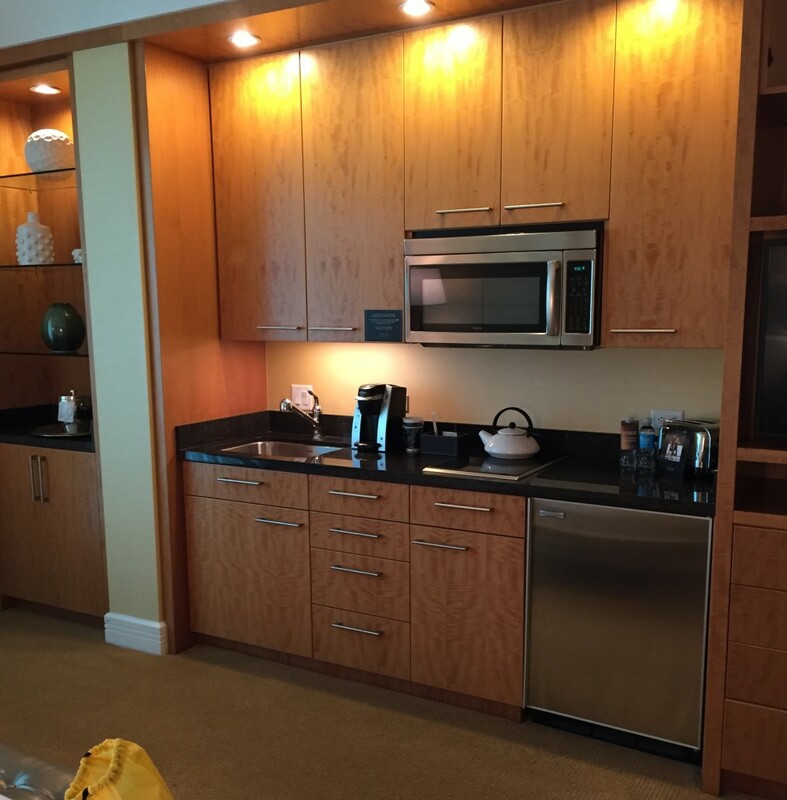 All the rooms feature a kitchenette or a full kitchen. 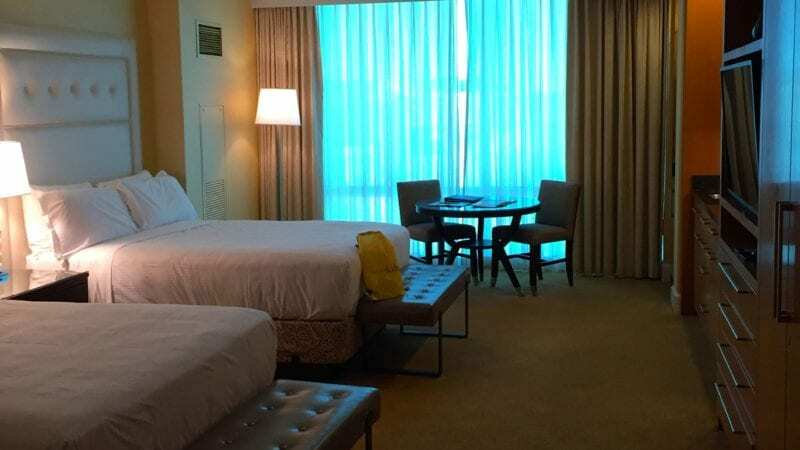 I must point out that it is not always affordable to find a room in Las Vegas with two beds in the room. If you are searching for a place to stay in Las Vegas and need two beds, you should seriously consider staying here. Back in 2010 we actually lived at the Trump Las Vegas hotel when we PCS’d to Nellis AFB. It was awesome to stay in here because of the kitchenette. It gets really old eating out. When you are on a long military move you have already eaten out for days on end as you travel across the country. So, once you are in the hotel you will be staying at for a while you definitely want to be able to prepare meals. Jonah and I especially loved hanging out at the heated rooftop pool. The pool has lots of attendants and we had our very own. The pool menu is extensive, but we had just had breakfast and stuck to just drinks. Jonah enjoyed a fruit smoothie while I sipped a frozen cocktail. There is a cafe next to the pool if you want to eat inside instead. We choose to lounge on one of the oversize chairs under an umbrella. They also have air conditioned cabanas available. It was early in the day when we were out there, so there was no d.j., but more often than not there is a d.j. out there. Beside the swimming pool there are also two hot tubs. When we visited it was around 110 degrees outside so needless to say we did not try out the hot tubs! The DJT Restaurant and Lounge is the hotel’s main restaurant and bar. They are open for breakfast, lunch, and dinner and they have an extensive kid’s menu. 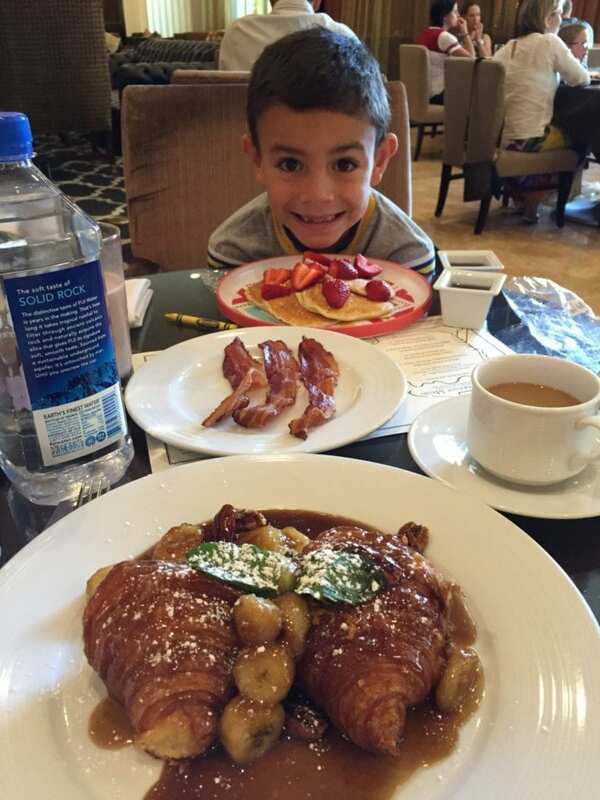 My son had the pancakes and I had the Croissant French Toast. Now this croissant French toast is the best breakfast I’ve ever had in Las Vegas. It’s made with La Belle Terre croissants, candied pecans, glazed bananas, and Las Vegas Distillery whiskey syrup. Keep in mind that I lived in Vegas for two years so I’ve eaten a lot of breakfast around town. Even if you do not stay at the Trump Las Vegas you should go there to have breakfast! The Trump Las Vegas offers a military discount! They also have a rewards program for their hotels. There is an on-site full service spa. When you stay the night at Trump Las Vegas you are given a $25 off coupon to use at the spa. They offer a complimentary shuttle to Caesar’s Palace and the front of Fashion Show Mall. 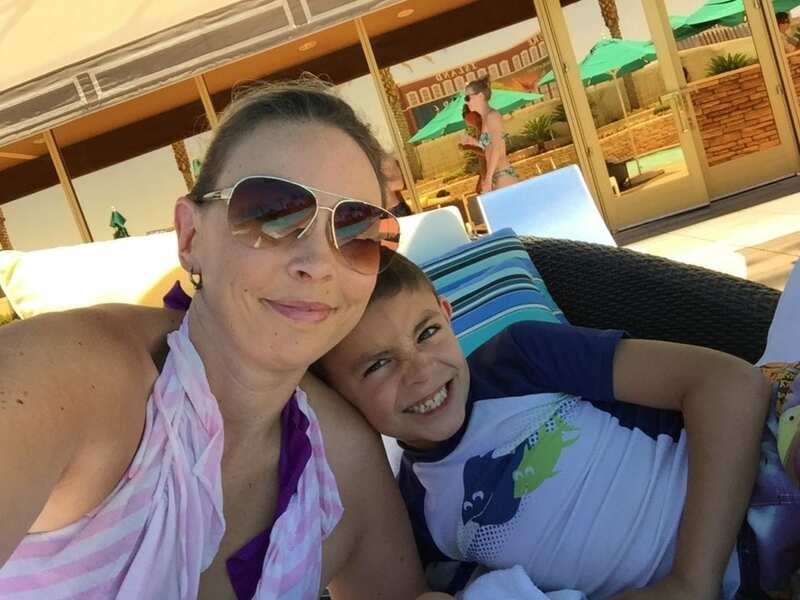 Be sure to check out my list of 25 Family-Friendly activities in Las Vegas and What you need to know when taking kids to Las Vegas on vacation.